Peaceful holidays: Qawra holidays form part of the trio of small coastal towns which make up St Paul’s Bay. Qawra holidays are also much more peaceful than neighbouring holidays in Bugibba, making Qawra ideal for older couples and family holidays. Perfectly placed: Holidays in Qawra 2019 offer the best of both worlds as you can enjoy the pretty scenery in St Paul’s Bay, the attractions in Qawra and the lively nightlife in Bugibba. And if things are ever too hectic or loud in Bugibba, you can always retreat back to the more sedate surroundings of Qawra holidays. Watchtowers: The area around Bugibba, Qawra and St Paul’s Bay has no less than three watchtowers guarding its coastline. All three were built by the Knights of St John based in Malta, including Ghallis Tower (around 1658) and Qawra Tower (around 1637). Enter the towers and climb to the top to enjoy fabulous views of the surrounding skyline. The watchtowers are essential viewing if you’re having your holidays in Qawra. St. John’s Co-Cathedral: Built in 1572 in the centre of Valletta (the capital of Malta), it’s worth travelling the 15km distance to visit here during your Qawra holidays. The Cathedral has a rather plain facade, yet the interior is a staggering work of art. With gilded decorations, coats of arms, ornate frescoes and marble floors. Many of the Knights of Malta are actually buried here, and it’s clear they had plenty of money to contribute to enhancing the cathedral’s opulent surroundings. Grand Masters’ Palace: Another attraction based in Valletta, this incredibly ornate palace is well worth visiting while you’re in the capital. Built in 1571, the palace was principally used for the grand masters of Malta, and then later for the British governors. Even today, the palace is still used to house Malta’s parliament and presidential office. The detailed frescoes and suits of armour make for some fascinating sights as you walk around the palace. Classic Car Museum: This quirky museum to visit on Qawra holidays has a large number of classic cars dating back to some of the earliest years of motor production. There are lots of classic models here, including the Fiat 500, the Jaguar E-type and even an old open-top Bugatti. Whilst it’s certainly a great attraction for car enthusiasts on Qawra holidays, there are also pinball tables, bubblegum machines, and jukeboxes all restored lovingly to add the nostalgia of the museum. Salina Park & Bay: In between Qawra and Bugibba, the open green space of Salina Park is located just as the end of Salina Bay. The bay was used for extracting salt (hence the name translated as ‘Salt Bay’), and you can still see evidence of this once burgeoning industry during your Qawra holidays if you visit the stone salt pans around the seafront. Kennedy Grove: These pleasant small gardens make for a lovely place to relax during your Qawra holidays if the Maltese sun ever gets too hot! You’ll also see that the pristine white monument in the centre of the park is dedicated to J.F Kennedy, the famous American president. Sunny Coast Lido: Conveniently located in the centre of Qawra, this lido is one of the best for sunbathing during holidays in Qawra. The area of St Paul’s Bay and doesn’t really offer much in the way of sandy beaches, but it more than makes up for it with this excellently equipped lido. Of course, you could always sunbathe around the pool if you’re having all inclusive holidays at a hotel in Qawra. Mellieha Bay: Considered by many to be the best beach in Malta, this golden sandy stretch is around 7km from Qawra holidays. It’s well worth travelling here to enjoy the emerald sea line and the huge selection of water sports. It’s easy to understand why this is Malta’s most popular beach! Golden Bay: Around 7km from Qawra, on the north western coast of Malta, you’ll find another gorgeous golden beach. This one is surrounded by rocky cliffs and lush green countryside, making it even more appealing for sunbathing during your holidays in Qawra. Incognito: This popular restaurant also doubles as a bar so you can spend whole evenings here during holidays in Qawra. Incognito also offers a wide variety of food on its menu, from authentic Maltese cuisine to traditional British classics. The very cheap set menu represents great value for money, especially if you’re looking for cheap Qawra holidays, and all dishes have generous portions too. The Overflow: This restaurant is a real winner for its setting on Qawra holidays. The leafy terrace and candlelit tables add a relaxing ambience, whilst the fresh fish, Italian pasta and homemade wine make your dining experience just as enjoyable. Ta Pawli: Another authentic Maltese restaurant on Qawra holidays where you can try local delicacies such as octopus stew and fish soup. The staff pride themselves on their attentive service, creating a warm friendly atmosphere to enjoy your food. Bugibba bars: In general, Malta is a much quieter place than many destinations in the Mediterranean. Qawra holidays is a pretty relaxed, laid-back resort too, with just a smattering of British bars such as Diana’s Pub, The Rose in Crown and The Queen’s Head. 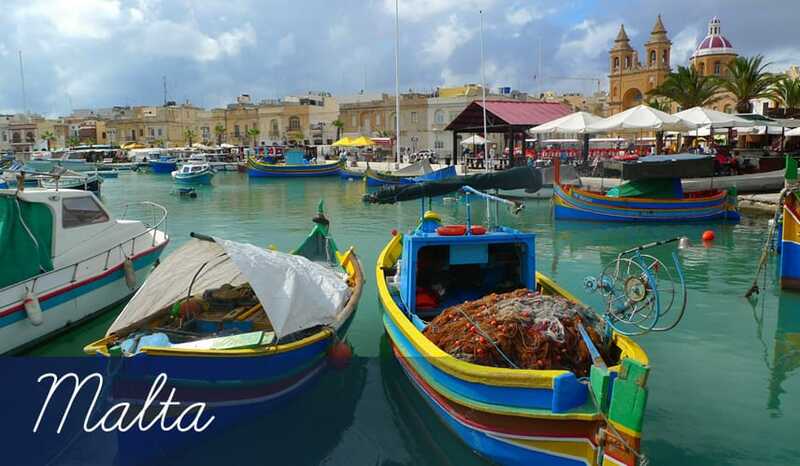 However, nearby Bugibba is certainly a little livelier than many other resorts you’ll come across in Malta. Much of the action in Bugibba is centred on one of the main town squares, II Baja Square. It’s here you’ll come across a few lively clubs like Amazonia and the Odeum. Some bars can be pretty raucous, such as the Corner Pocket (which offers a winning blend of pool and karaoke) and Wise Guys. But in Bugibba is perfectly possible to discover the ideal home-from-home experience, with British style boozers such as The Grapevine Pub, The Abyss and The Red Lion. But if you’d like a night out with a touch more glamour, head to the Oracle Casino, which offers a wide variety of gambling tables, a classy bar, a restaurant and regular evening entertainment. Or how about something a little more family orientated? The Bugibba Empire Cinema Complex has four cinema screens, a cafe, several bars and a sweet shop. Bugibba Shopping Centre: Besides a few small supermarkets and beachwear shops, Qawra holidays don’t really offer much when it comes to shopping. And although Bugibba doesn’t have much choice either, you could certainly find more than enough souvenirs to bring back home in the two-tier Bugibba Shopping Centre. It’s ideal for picking up postcards, newspapers and surprisingly cheap leather goods. City shopping: If you’d like to broaden your horizons a little when it comes to shopping in Malta, you should make the 15km journey to the capital, Valletta. In the many independent shops here it’s possible to pick up flavoured liquors, handmade glass and boutique fashions. There’s also a large shopping centre (with cinema screens) and some lively street markets.